The quality of water in a pool can affect your experience with swimming in it. Even though you might believe that the pH of the water can’t be visibly affected by external factors such as rain or particles that get into it, the truth is the pH can be easily altered. The next step is to determine what pH your pool water has. A pH of 7 shows that the water is at neutral; over 7 means that it is alkaline, while the level below 7 shows acidity. You should aim at a pH level between 7 -7.6. Suppose the pH is greater than 8, all people who swim in it can develop various skin conditions, while the pH of less than 7 can cause eye frost. 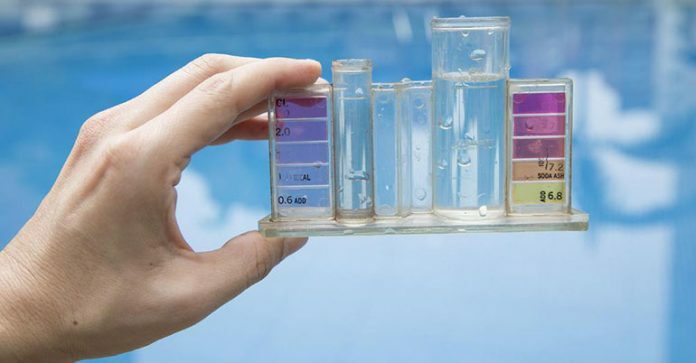 Remember to keep checking the pH of the pool, regardless how often you used it lately or the current weather conditions. One way to raise the pH in your pool water is by using soda ash. Soda ash can be bought in specialized pool stores or can be ordered online. Soda ash can be named differently depending on the producer who distributes it. The ingredient list of this product should only contain sodium carbonate as an active substance. There are many types of soda ash on the market, so pay attention when buying the product. Some may be used for other purposes. Next, measure how much water is in the pool and calculate how much soda ash you need to use in order to lower the pH to the adequate level. 200 g of soda should raise the pH in a regular pool by approximately .2 pH points. pH minus to lower it Lowering the pH in a pool can be done using a pH minus product. If the pH exceeds the 7.6 value it needs treatment right away to avoid developing the unpleasant symptoms mentioned above. The pH minus powder comes in multiple forms – you can either spread the powder on the surface of the water without diluting it, or you can dissolve the powder in a bucket and put it in the water afterward. Calculating the amount of pH minus that need to be used depends on the size of the pool.